ThinkPad-Discounter. 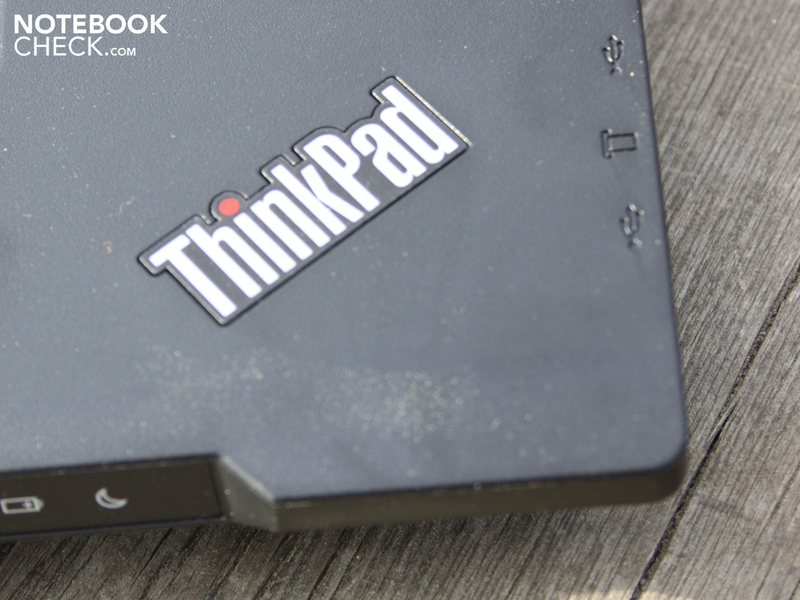 A real ThinkPad available for less than 600 Euros? 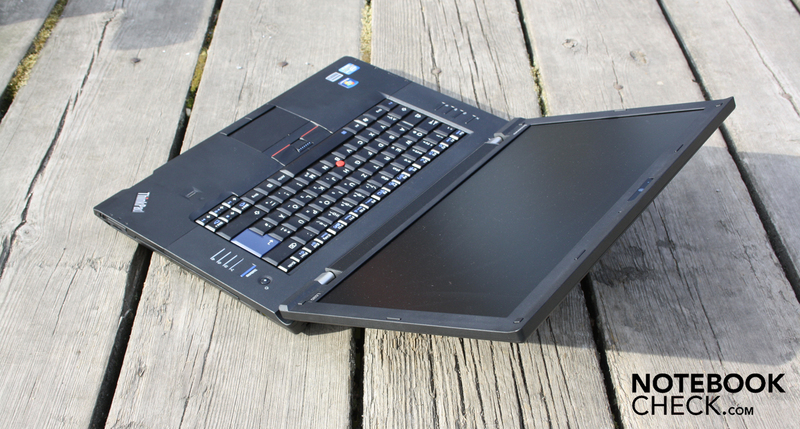 Lenovo's low-cost ThinkPad L520 makes it possible. Included are good input devices and a Docking Port. Perfect business style in a casual black? 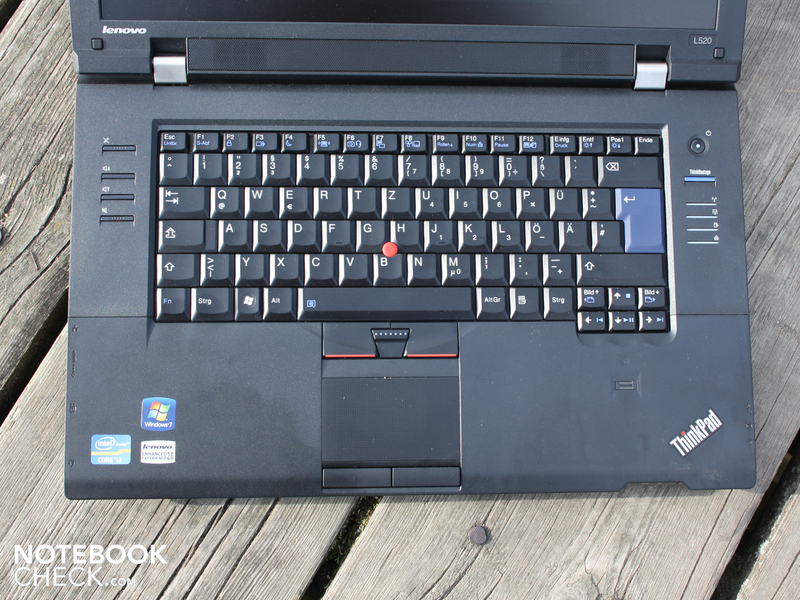 The time when only well-heeled business people carried around robust laptops with the label ThinkPad are long gone. 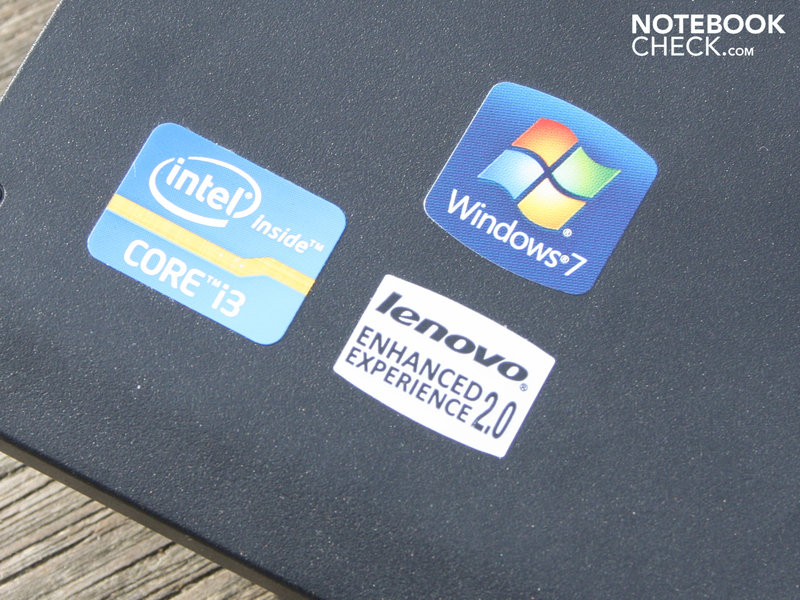 Lenovo required large volumes, and provided more and more affordable versions with the prestige brand over the years (L-Series from 2009). The L520 in front of us is already available from 570 euros. In this case there may not be a Windows operating system included, but there are business features such as a Docking Port, a non-glare LED TFT, and also several interfaces including eSATA, DisplayPort, and ExpressCard54. Why spend 1375 euros for a ThinkPad from the T-Series, when a L520 low cost package includes the most important features? 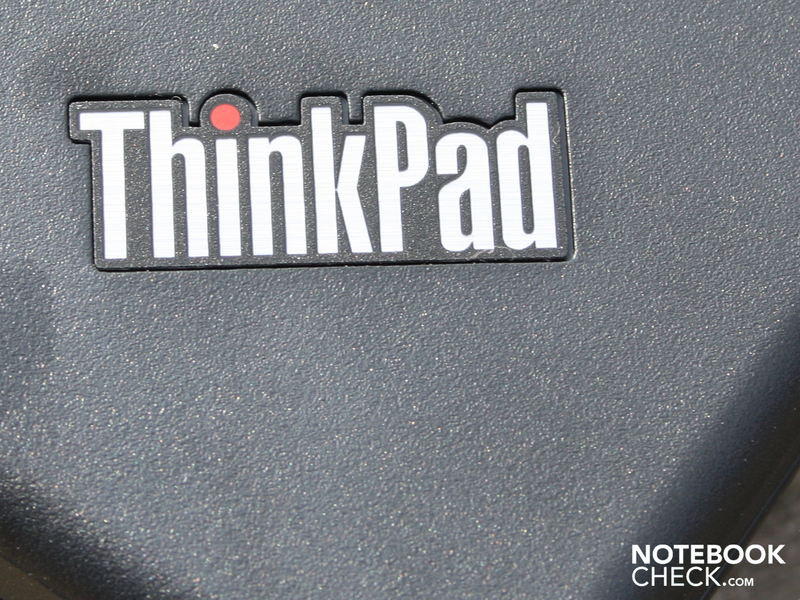 Can the input devices, display, and the manufacturing quality keep up with the more expensive ThinkPads? All the answers to these questions are in the following review. 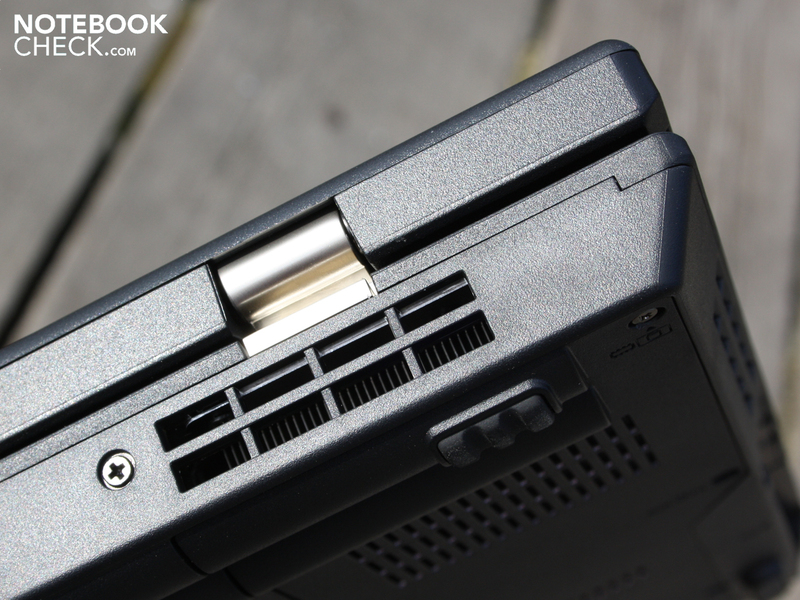 The DVD drive is a small weak spot of the stability. Massive rigid hinges made of pure metal. 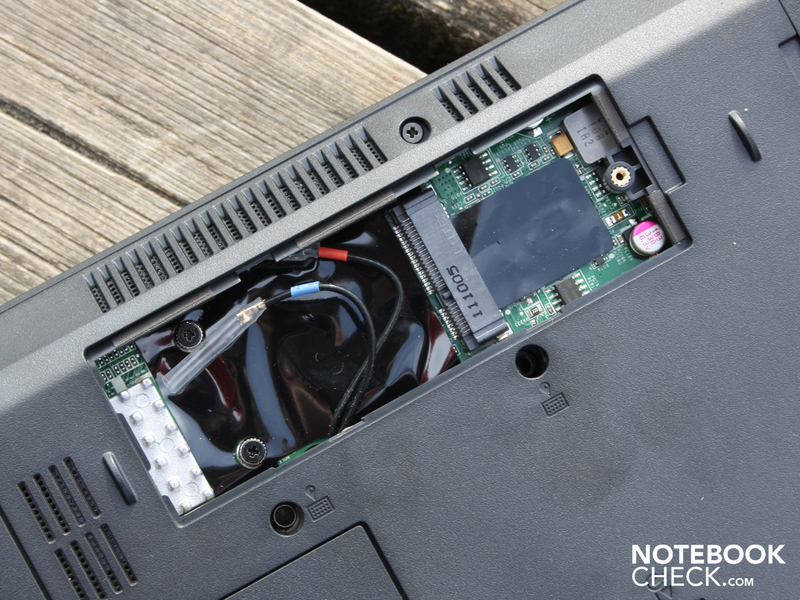 When it comes to the manufacturing quality, the ThinkPad L520 shows its strengths. We may not be dealing with a perfectly stable construction, but overall everything is well put together. 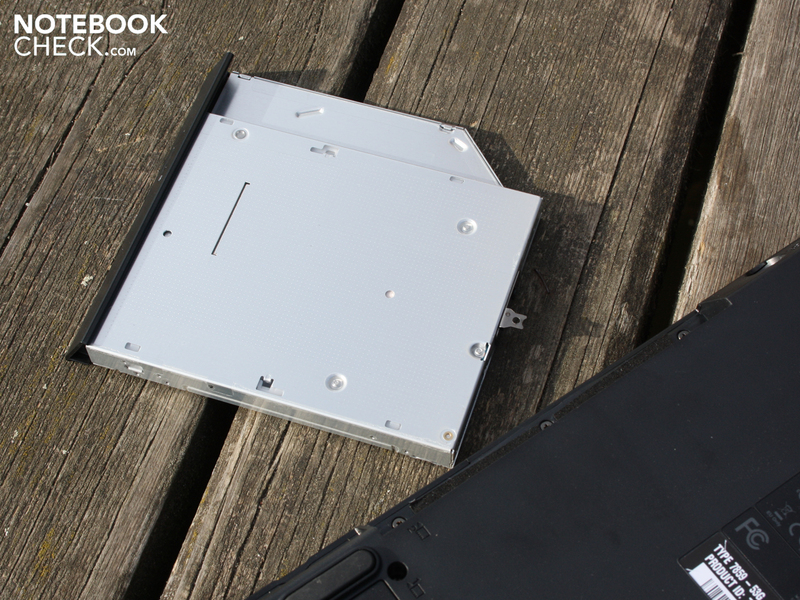 The medium weight chassis (2604 grams) is relatively good for the 15.6 inch form factor. The dimensions are not hidden, with hard edges and a thick lid along with a very big palm resting area, providing for a massive appearance. The chassis can be bent marginally, with both hands holding the front edges. Under the optical drive the thin plastic can be dented easily though, whereby the base unit of most notebooks is the least stable in this area. As long as the device is primarily sitting on a desk, users are unlikely to notice this at any point. The criticism stops when it comes to the massive metal hinges. These are very firmly attached to the case, and hold the display firmly in place. Opening with one hand is possible though. On bumpy rides the lid only wobbles very little. The surface is made of a hard plastic, which can be dented inwards significantly in the middle. The lid is covered in a robust and scratch resistant coating. The rigidity of the lid could be better though, since this can be bent considerably when holding both of the edges. 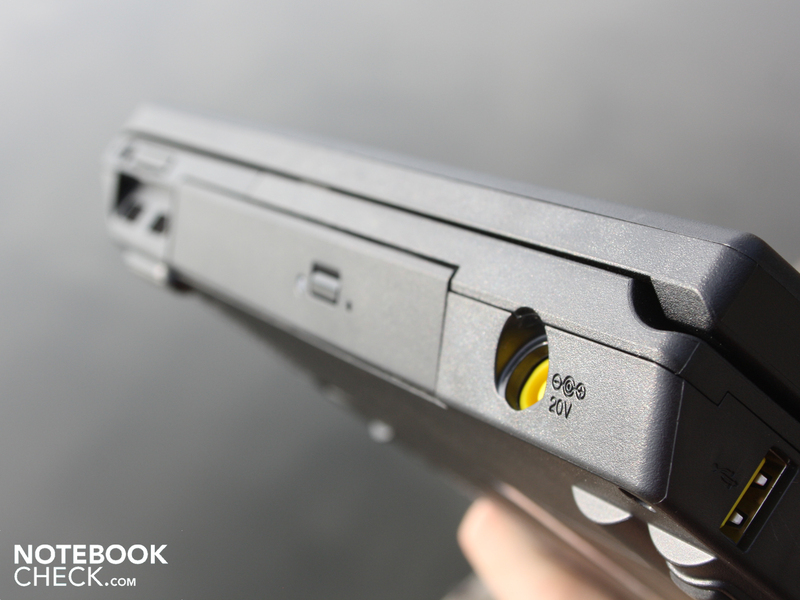 The thick lid isn't as stable as could be assumed, which is a clear disadvantage compared to the T-Series. There is no display catch in the form of a latching mechanism. Thus only the tightly closed together lid and base unit can prevent small items from getting in between during transport. It is theoretically possible though, that the lid could open slightly during transport, which could lead to small items slipping in between. Professionals and demanding users value a large number of interfaces. 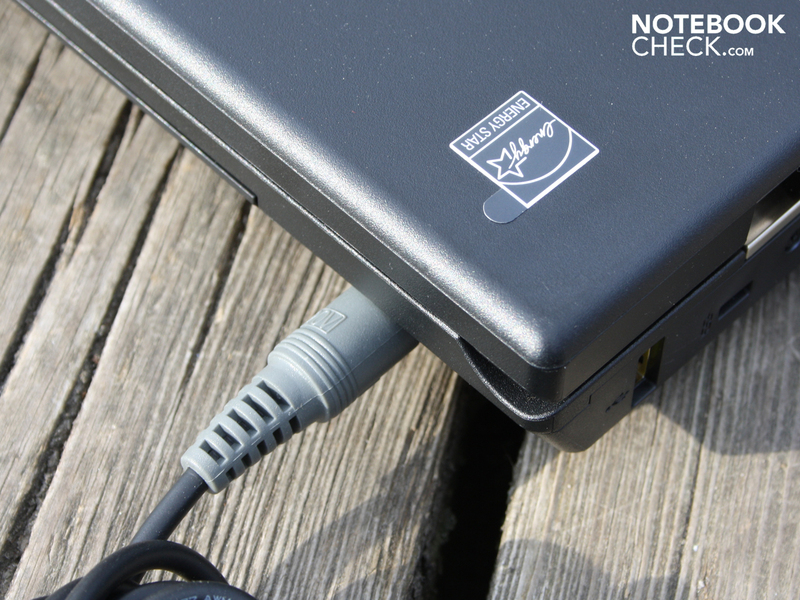 The 15.6 inch L520 has everything on board that can be expected from a work notebook. This includes a DisplayPort, an ExpressCard54 slot, and a card reader. 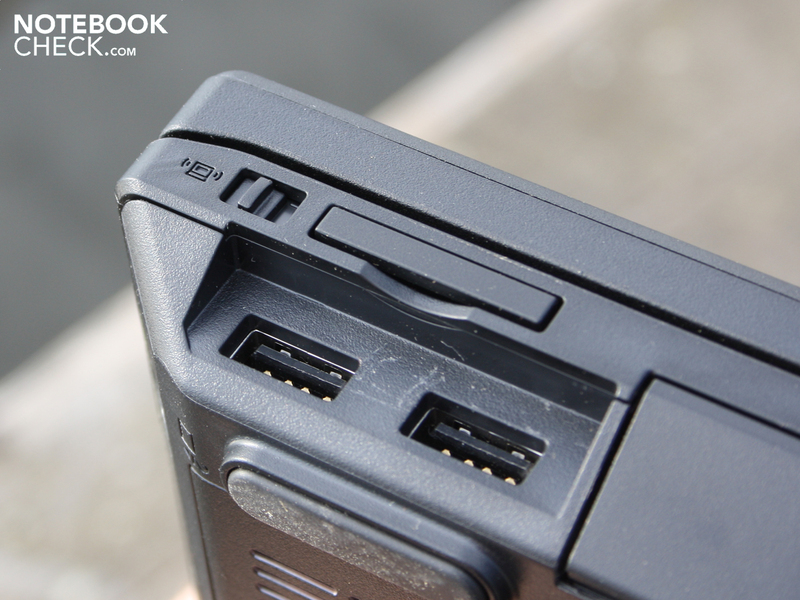 There is also an eSATA port for connecting fast external hard drives, although there is no USB 3.0. The latter of these can be attached to the ExpressCard54 slot for about 20 Euros though (controller card). The bulk of the interfaces is located closely together on the left side. In cases were all the ports are occupied, this will lead to a lot of cables strewn over the desktop. 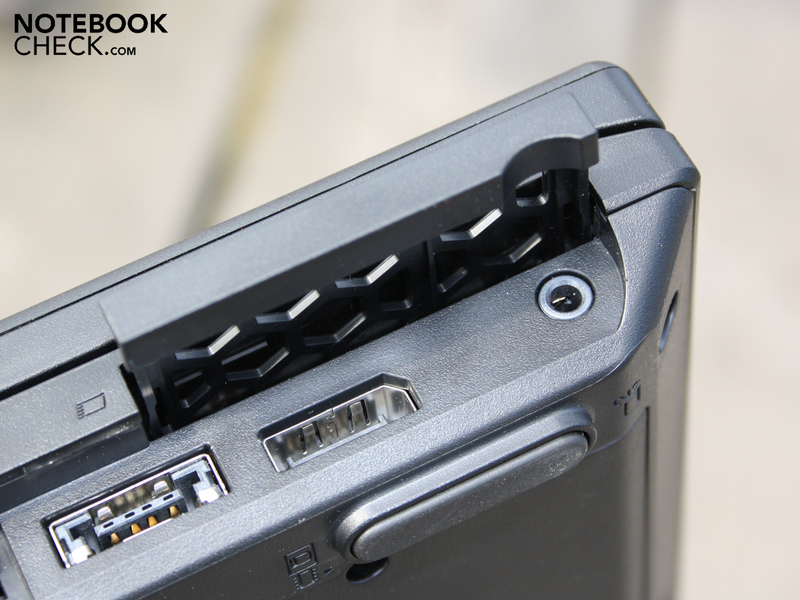 The universal Docking Port for the L-Series provides a solution for this scenario though. 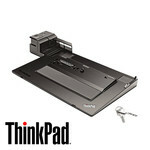 The Lenovo Minidock 3 docking station for the L-, T-, and X-Series is compatible (45N6678). For a reasonable price of about 150 Euros, this provides VGA, DVI-D, DisplayPort (2 usable at the same time), 6 x USB 2.0, Gigabit LAN, microphone input, headphone output, integrated locking (with key), and a 90 Watt AC adapter. 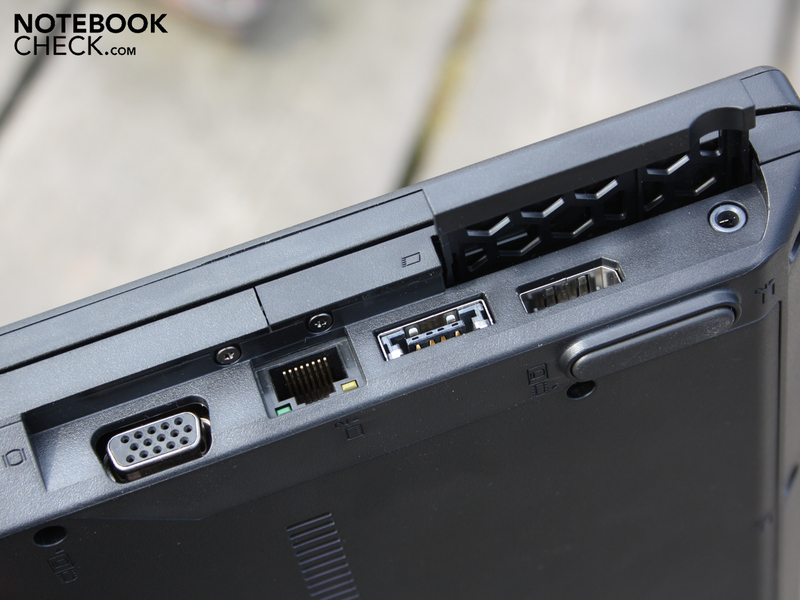 Lenovo also states that the eSATA port on the docking station is not compatible with the ThinkPad L-Series. 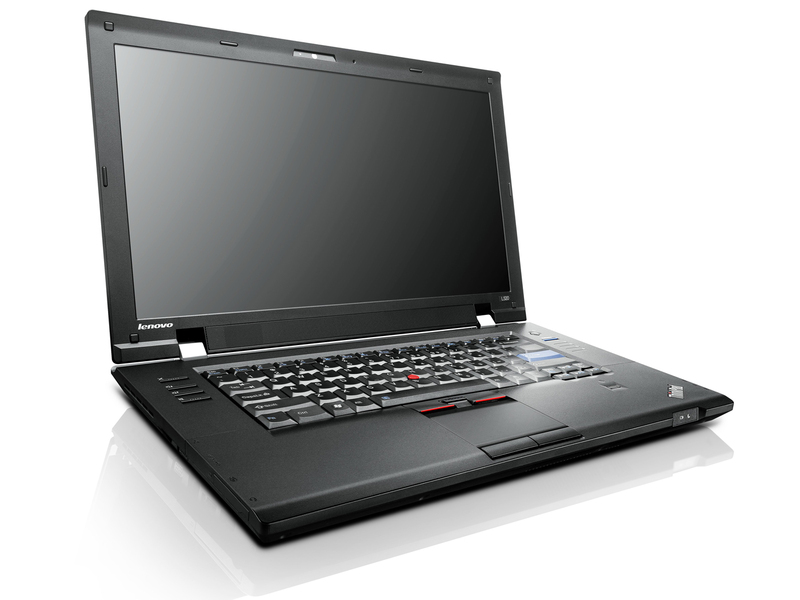 As a business notebook the ThinkPad L520 provides for everything as far as standard communication technologies are concerned. Since we opted for the basic version, there is no HSDPA module included. The relevant Mini PCIe sockets for the module, next to the antenna and a SimCard slot, are available though (model variant). The WLAN card provides for 802.11 b/g/n standards, and the Ethernet controller communicates with Gigabit speeds. Bluetooth 3.0 is also included in the package. Internet telephony and video chat is possible with the Webcam integrated into the L520, which provides a resolution of 1280 x 720 pixels (widescreen). Using the Communications Utility, the microphone can be optimized for recording one or more voices (conference). There is also a button for muting the microphone, which is very practically located together with the volume control on the left side next to the keyboard. 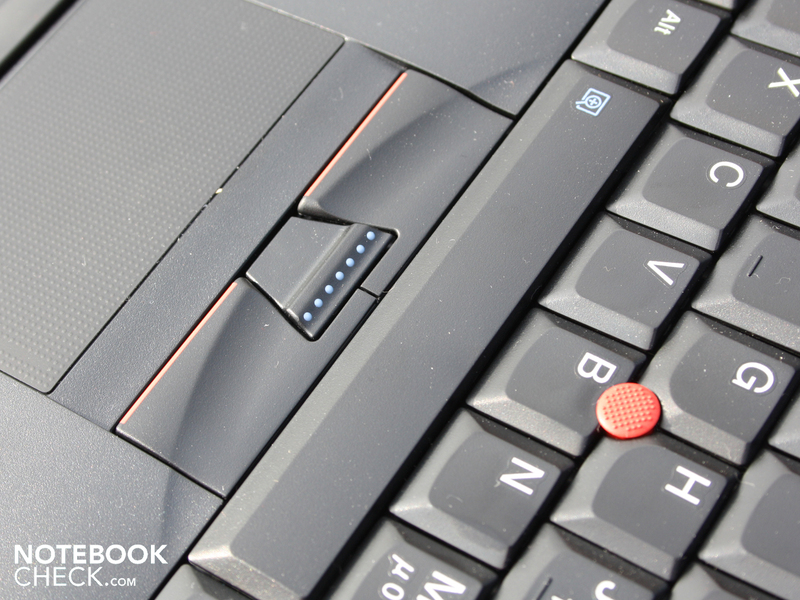 Business characteristics, such as a fingerprint reader, Computrace theft protection, a marginally waterproof keyboard, APS (movement sensor for hard drive), and a Kensignton Security Lock, are topped off by Lenovo with the ThinkVantage-Tools which can be started using the blue ThinkVantage button. Using this the manufacturer provides access to security, power, and system configuration settings, as well as back up and restore options. 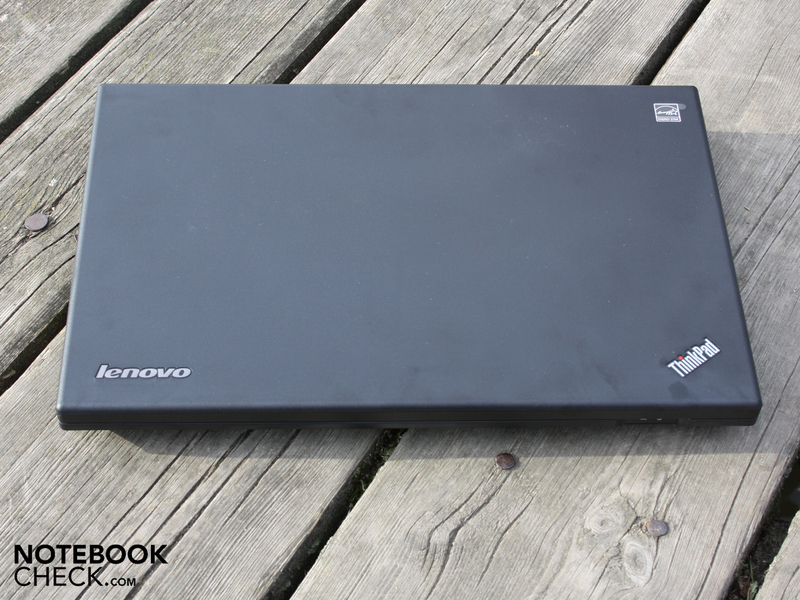 Recovery media are not included with the Lenovo delivery. In this case users will have to make their own recovery DVDs (system image; rescue and recovery). The accessories only include a warranty leaflet, and a short manual. The standard warranty for the L-Series consists of a considerable 36 months. This also includes the on-site service, which is exceptional for a device costing less than 700 Euros. The keys have a crisp pressure point, and a very clear key travel (approximately 4 millimeters). 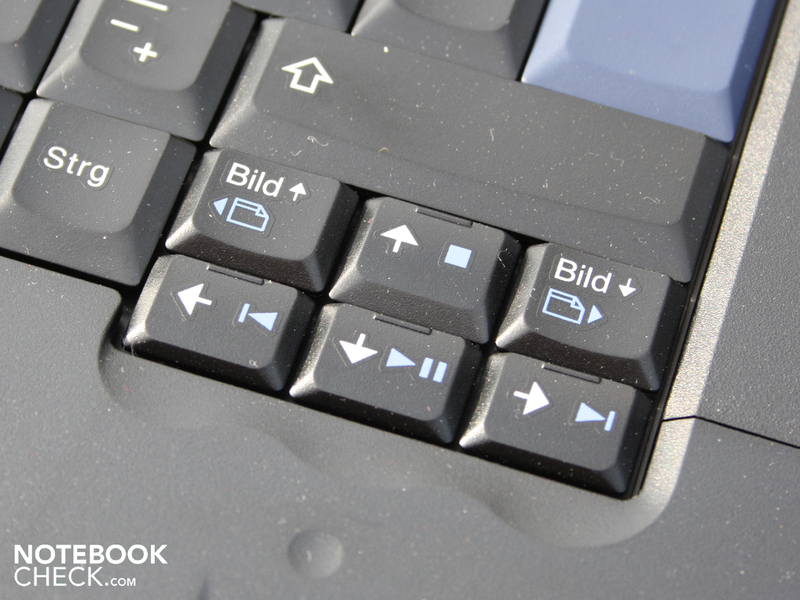 The slightly separated and smaller arrow keys stand out from the key triangle slightly, and can be operated very easily without looking. There is no alphanumeric keypad, which can be a disadvantage when entering many numbers. Users can create one using the Fn keys though. The relevant numbers and calculator symbols are marked on the keys with white text. 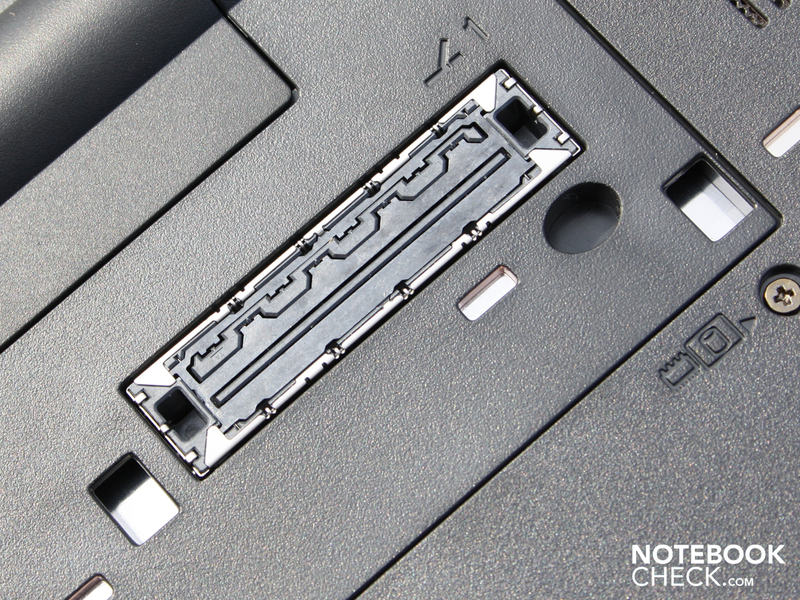 The keyboard support on the 15.6 inch L520 is unfortunately not firm everywhere. From the left to the middle, users are provided with a firm end stop. On the right, where the optical drive is located, the surface is a little bit bouncy. Although users that type sensitively won't likely notice this excessively though. The keys themselves are pleasantly grippy. The mouse replacement is provided the professional way by Lenovo as two variants. 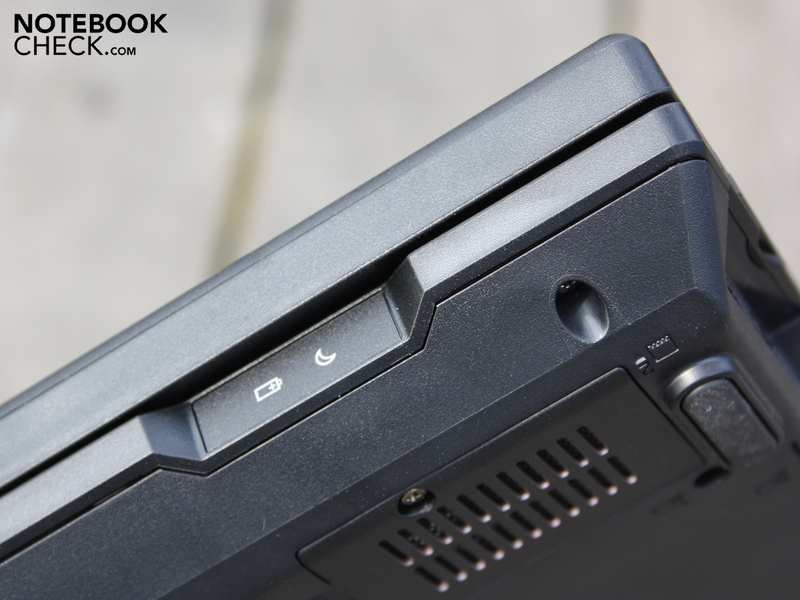 Depending on preference, users can opt for the conventional Touchpad or the Trackpoint (ThinkPad UltraNav Pointing Device). 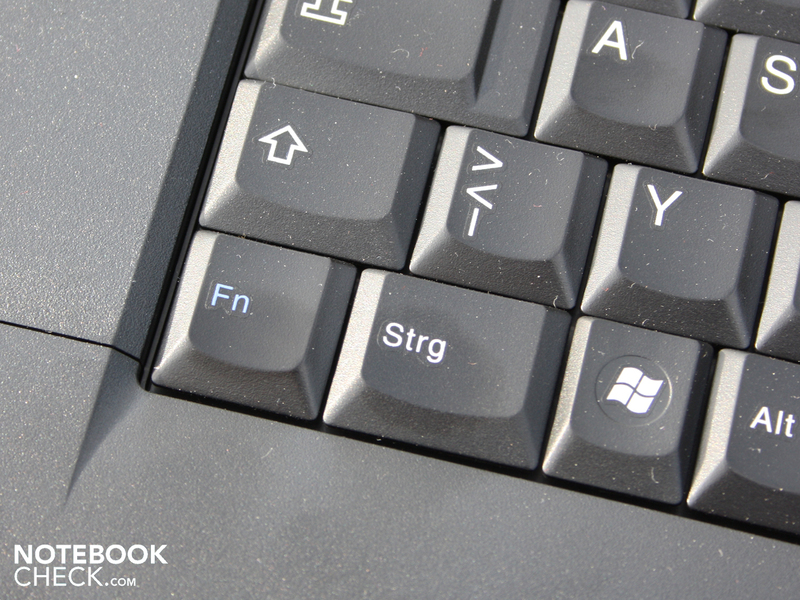 The three Trackpoint buttons are located below the space bar. All the mouse buttons are composed of plastic, and are therefore a little on the slippery side. The buttons have a very clear travel, and an extended but clear pressure point. The use of the mouse replacements impresses in all aspects. 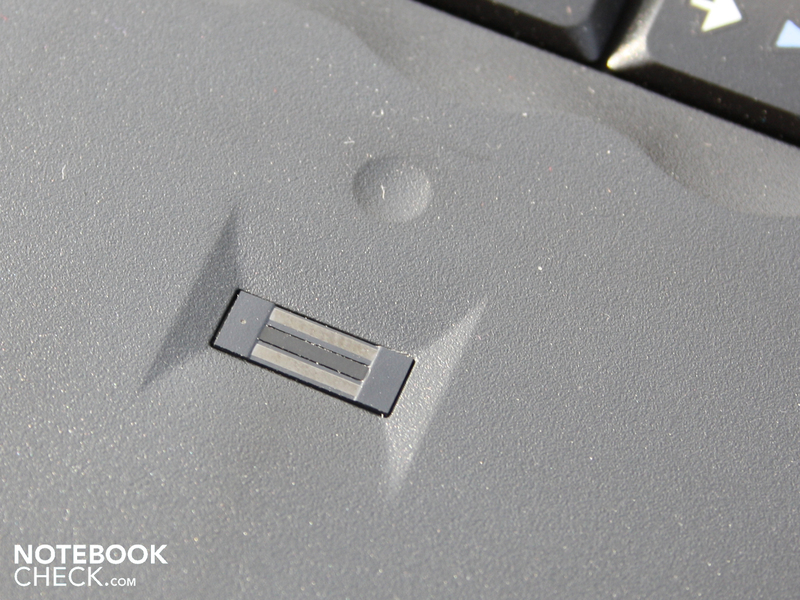 The quiet operation of the buttons, and the long pressure point, are worlds better than the mass of consumer notebooks. The touchpad is sufficiently scaled with 8.6 centimeters, is sensitive up to the edges, and the surface has small bumps which provide for an improved gliding feeling. Multi-touch gestures are also supported. 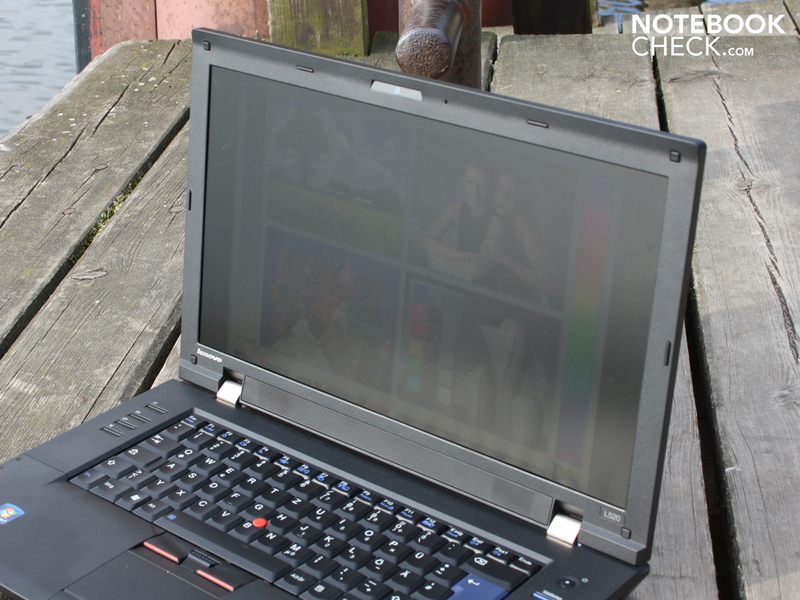 The HD-Ready display on the ThinkPad L520 has a resolution of 1366 x 768 pixels, which is relatively small. The panel is non-reflective, which is why users don't have to worry about reflections. For use as a work device the display is not ideal though. A WXGA++ resolution of 1600 x 900 pixels would provide more oversight, which is especially useful with applications that have a lot of toolbars. The L520 version with WXGA++ has a hefty price of 1000 Euros though (NYZ4JGE). High contrasts for the improved perception of colors in pictures, tables, or texts are not available. We measured a black level of 1.3 cd/m² using the maximum brightness. This equates to a weak contrast of 175:1. Whether the color space of the WXGA++ panel in the NYZ4JGE is similarly small, cannot be determined in this case. The WXGA panel on our tested device is definitely far away from the often used Adobe RGB (t), which is also the case for sRGB (t). For the sake of comparison, we have provided the values from a good panel in the Latitude E6520 full-HD (t). 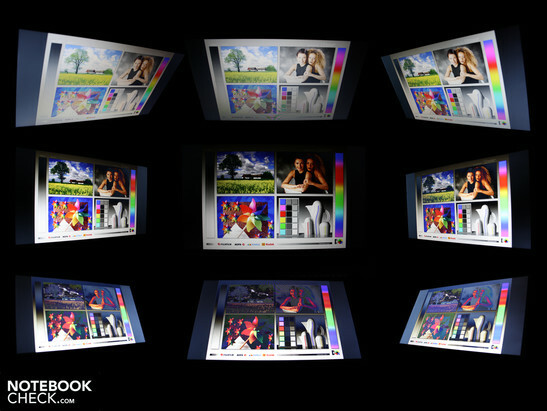 The LED backlight of the 15.6 inch display illuminates the panel up to 227 cd/m² in the middle. For use indoors this is more than enough, since the average value lies at 220 cd/m². With the non-reflective TFT panel, and a good brightness level of 220 cd/m² on average, the 15.6 inch L520 can definitely be used under sunlight from time to time. Under direct sunlight we quickly noticed that the brightness is still not sufficient though. In addition to this the viewing angles become considerably smaller in this scenario, and the colors become pale. 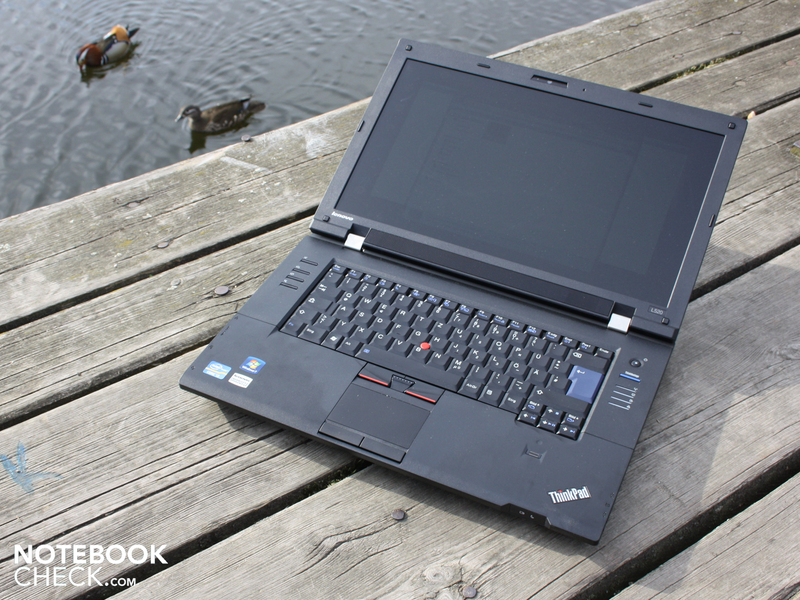 For use in the park or in a cafe, the ThinkPad L520 is therefore not suitable. 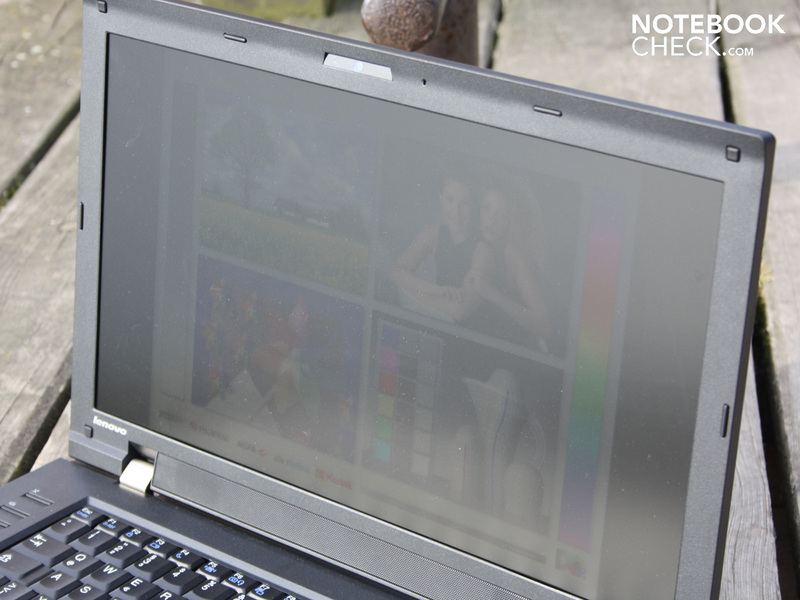 The matte display does provide a good basis for working though. 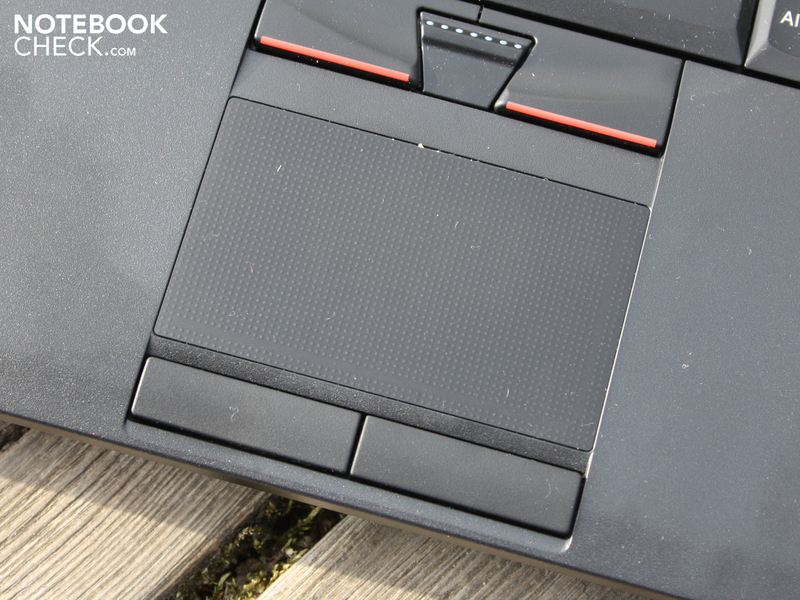 Office notebooks typically offer very bad viewing angles, especially in the lower and middle price ranges up to 1000 Euros. The ThinkPad is no exception to this. Horizontally the colors begin to change from 45 degrees. Vertically our eyes could deviate up to 10 degrees, after this the colors began to clearly invert (see video). 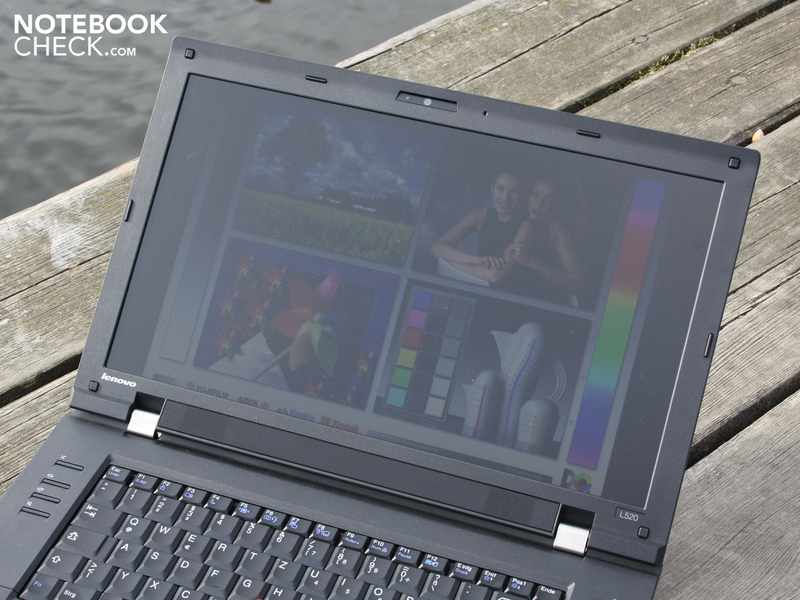 Lenovo's 15.6 inch notebook is equipped with an Intel Core i3-2310M (2 x 2.1 GHz). The Core i3 dual-core CPU doesn't support Turbo-Boost, but does support Hyper-threading (4 threads). The CPU power consumption lies at 35 Watts according to TDP. 10 Watts are required by the integrated Intel HD 3000 graphics solution and the memory controller. Compared to the expensive Core i5 models, such as i5-2540M, the i3-2310M doesn't support AES New Instructions (en- or de-cryption). 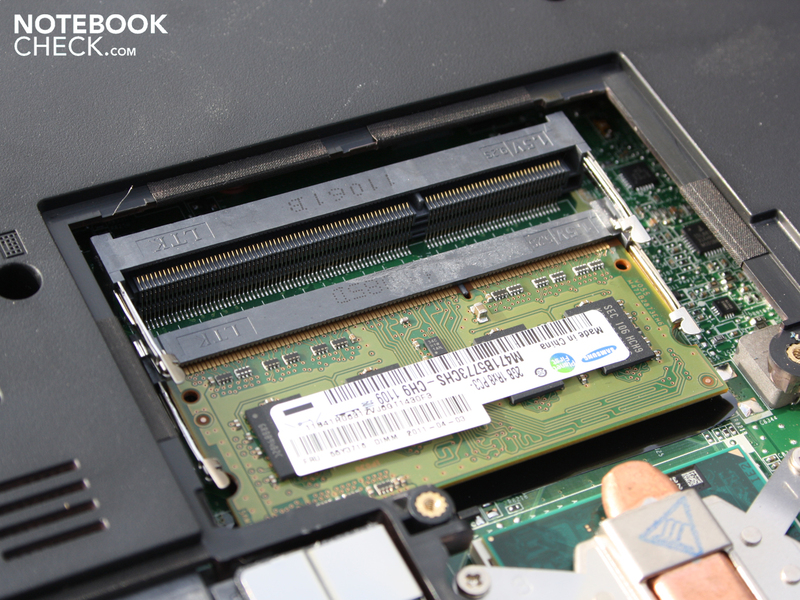 There are only 2048 MB DDR3 RAM on board, whereby only one of the two available sockets is occupied though. In this case it is possible to upgrade to 4 GB for a small sum (approx. 20 Euros). The hard disc is a Western Digital HDD (WD3200BEVT) with 5400 rpm that has a capacity of 320 GB. The i3-2310M (2x2.1 GHz) manages to score as many points (2747) in the Single-Core Cinebench R10 Single 32-bit, as the markedly faster i3-380M (2x2.5GHz) from the Arrandle generation (2769). The big brother i5-2410M (2.3GHz, Turbo) manages a significantly better 4510 points (64-bit). When it comes to day to day tasks multi-threading is more relevant. The i3-2310M manages higher scores (7416) in this discipline than the i3-380M (6233). The 2011 i5-2410M and i5-2520M manage 9451 and 10128 points respectively (Cinebench R10 Multi 64-bit). Summary: The Sandy Bridge Core i3 can take on its faster Arrandale predecessors with its slower 2.1 GHz clock speed. The PCMark Vantage benchmark determined a score of 4300 points. This level is significantly lower than that of older systems with the Core i3-380M (Samsung RV511: 5432) or the i3-370M (Samsung SF510). The 3DMark2006 benchmark, as a measure of the general gaming suitability, reaches 2999 points. The 2010 Intel HD generation (also integrated into CPU) managed an average of 1500 points. This speaks for an improved but still meager gaming performance. How this manifests in detail has been comprehensively covered in the article for the Intel HD Graphics 3000 graphics solution. Also see the datasheet for the HD Graphics 3000 for details. Less demanding games such as Fifa 11 run smoothly with high details. Hardware intensive games such as StarCraft2 or Battlefield: Bad Company 2, have to be set to minimal settings though. The Western Digital hard disc has a total capacity of 320 GB. Measuring the casual 5400 rpm with HD-Tune and CrystalDiskMark resulted in relatively high data rates between 72 and 83 MB/s for sequential read. The HDD-Score in PCMark Vantage lies at 3228 points. 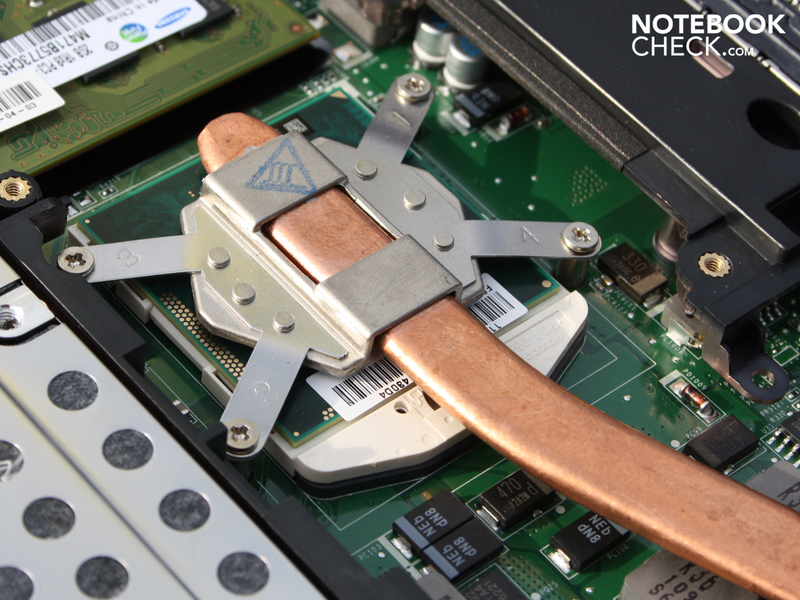 Only a SSD would provide the L520 with a real boost in this aspect. 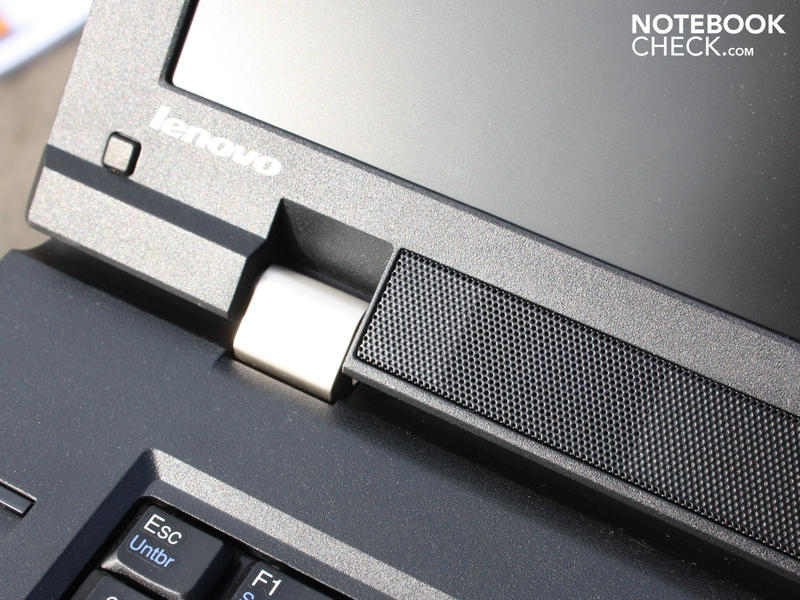 When it comes to the system noise, Lenovo's 15.6 inch notebook manages to score many points. In an idle state or when surfing the web, the cooling fan switches off for longer periods of time. We measured 29.8 dB(A) in this scenario as the base noise emitted from the hard disc. Those that are watching a DVD movie could find the 42.8 dB(A) a bit disturbing though. For an otherwise extremely quiet notebook, this is quite unfitting. During the stress test (Furmark/Prime95) the cooling fan only turns up to 34.2 dB(A). The cooling fan turns at a constant speed with a consistent load. 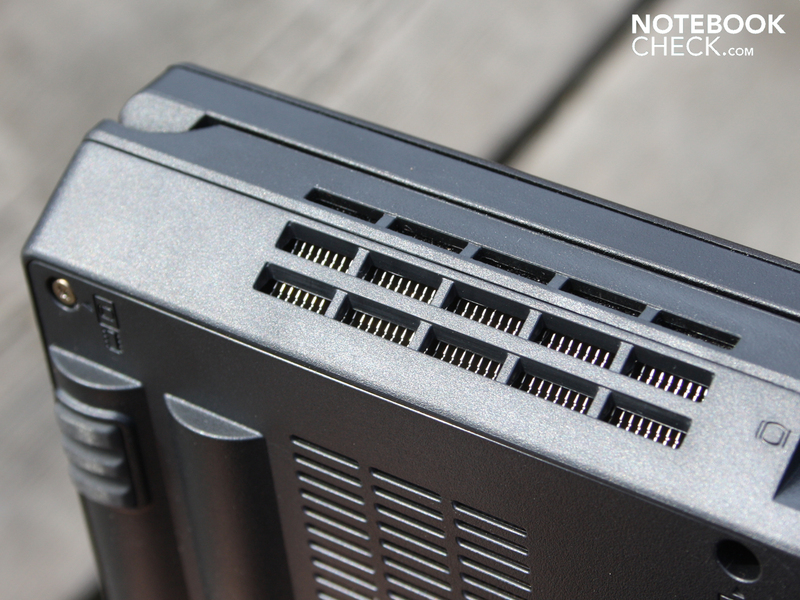 To praise: 3D load, which is processed by the Intel HD Graphics 3000, doesn't cause any problems for the L520. The noise level merely rises to 32.3 dB(A), which is only marginally louder than the faint clicking of the HDD read and write heads. In an idle state the average temperature on the base plate and the palm resting area lies at a mere 20 degrees. When surfing or during stress free office use this doesn't change materially. The 25 degree mark is at most breached in the middle of the base plate. The heat dissipation under a high load just about reaches 35 degrees, but only in some places. The average still does not rise over 35 degrees. 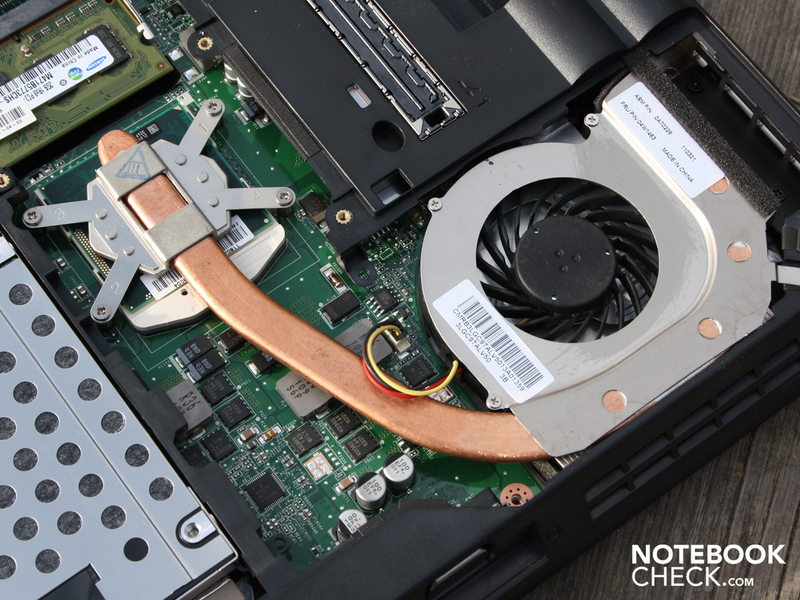 The cooling system seems to easily come to terms with the heat dissipation from the 2.1 GHz Core i3-2310M. (+) The average temperature for the upper side under maximal load is 27 °C / 81 F, compared to the average of 29.4 °C / 85 F for the devices in the class Office. The two speakers at the bottom of the display frame do not provide balanced audio. They emphasize on the high frequencies. Bass is missing completely. For less demanding use as an office laptop the acoustic qualities are acceptable though. The maximum volume is sufficient for a meeting room, whereby the small speakers start to distort at higher levels. 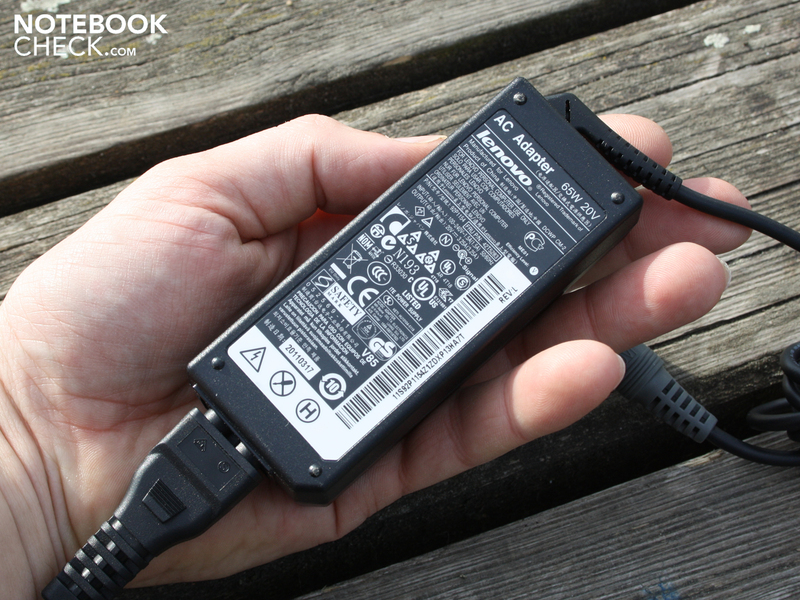 The 15.6 inch L520 is equipped with a 57 Watt-hour battery (4680 mAh). This keeps the ThinkPad on its legs for a surprisingly long time, especially when the processor and graphics are not utilized. Approximately seven hours sound like a good battery life. These 408 minutes are only achieved in an idle state though, with a low brightness setting and a deactivated WLAN. More relevant is the WLAN test, which reached almost six hours. The brightness of the TFT was set to 100 cd/m² during the test (medium setting). In light of the mediocre capacity of the battery, and the low idle state power consumption (10-14 Watts), the battery life is not surprising. Before we could start our tests again from the beginning, we only had to wait a short charging time of two hours (2:10h). The power consumption shows a large gap between an idle state and a high load. This is due to the perfected adaptive power consumption of the Intel Core processors. The idle power consumption of the L520 lies at between 9.6 Watts (power saving, lowest brightness) and 13.7 Watts (maximum performance, maximum brightness). For comparison: A typical 2010 office notebook such as the HP 6540b with Core i5 430M requires 13.3 to 18.8 Watts in the same idle scenario. The 3DMark2006 (Intel HD 3000) requires 40 Watts on average. During the stress test the Core i3 adds to this. We measured 47.5 Watts. The compact 65 Watt AC adapter (242 grams) is suitably dimensioned for this. The handy AC adapter only weighs 242 grams. The straight plug would have been better at the back. Altogether the 65 Watt adapter seems very compact. One thing has become abundantly clear following our test: In case of a shortage of cash, there is room for a ThinkPad from the L-Series next to a cup of coffee. For under 700 Euros (under 600 Euros without an OS) there is a full-fledged business notebook on the Ikea desk. 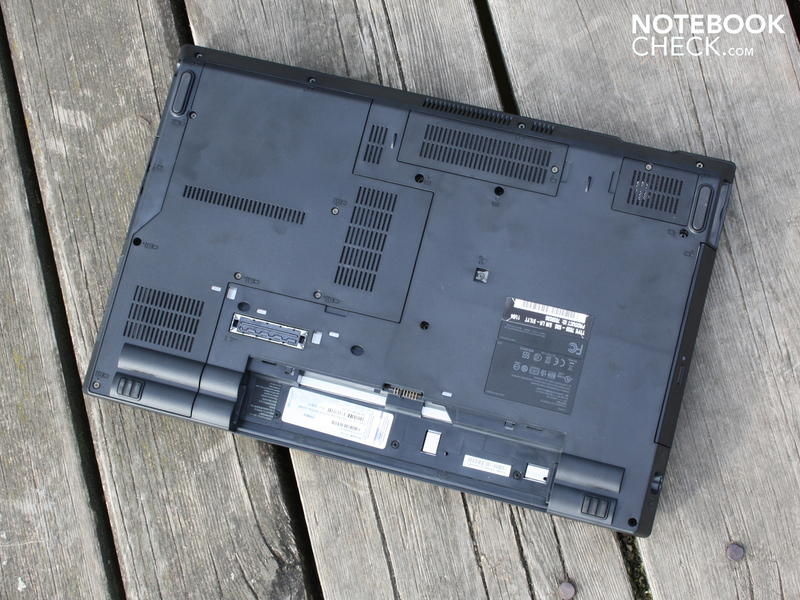 The 15.6 inch L520 has its strengths precisely where they are required for serious office use. 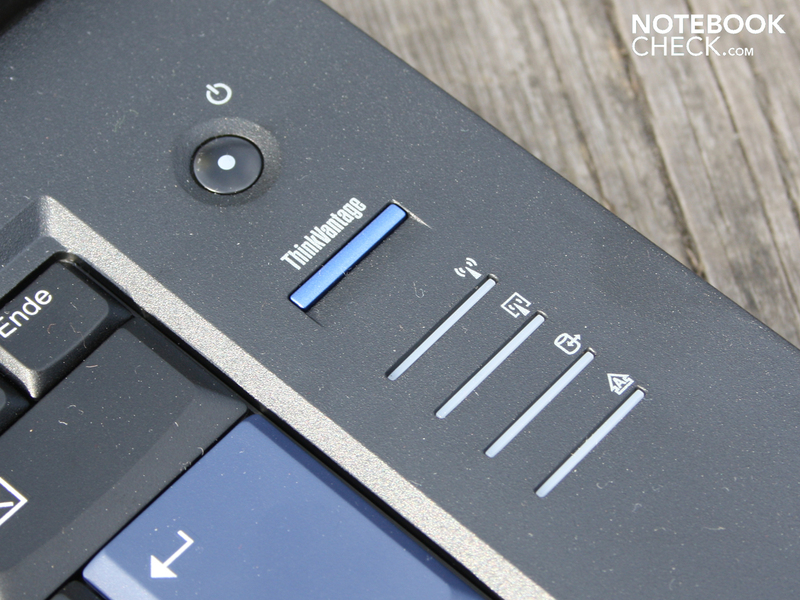 The matte display, along with a perfect for typing and conical keyboard, as well as the numerous interfaces including a Docking Port, plus the matte robust surfaces, make the ThinkPad L520 a exceptional work partner. For a Very Good rating there are still some things lacking unfortunately, such as a dedicated graphics card, HD-Ready resolution, more than 2 GB of RAM, and a slightly better processor than the Core i3 (new Sandy Bridge generation). These are however almost all features that users can upgrade for a small price (Core i5, 4GB, WXGA++). Merely the dedicated GPU al la Nvidia NVS 4200M stays as the defining feature of the expensive T-Series (T520). Whether a price of 1375 Euros (plus further additions) has to be accepted, is questionable in light of the solid qualities of the L520. 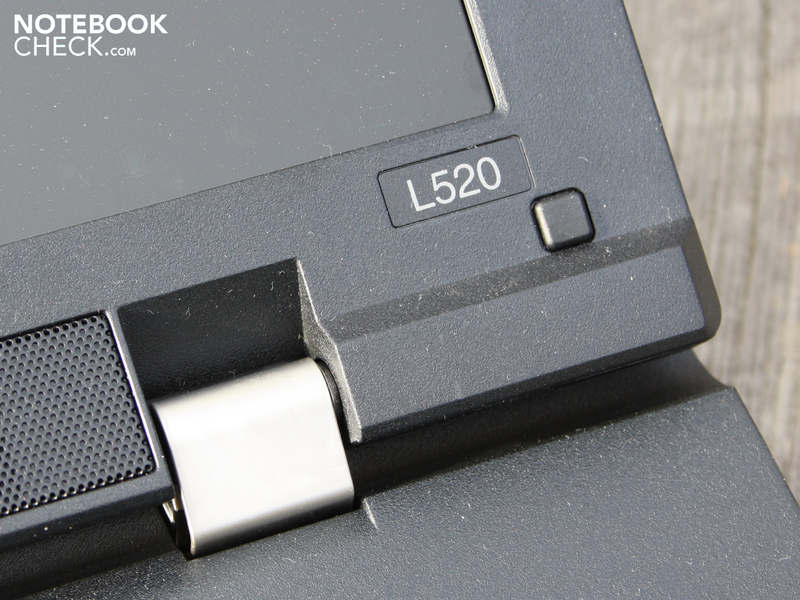 Everyone who is looking for a business notebook with solid performance characteristics and good input devices, will find an interest in the L520. 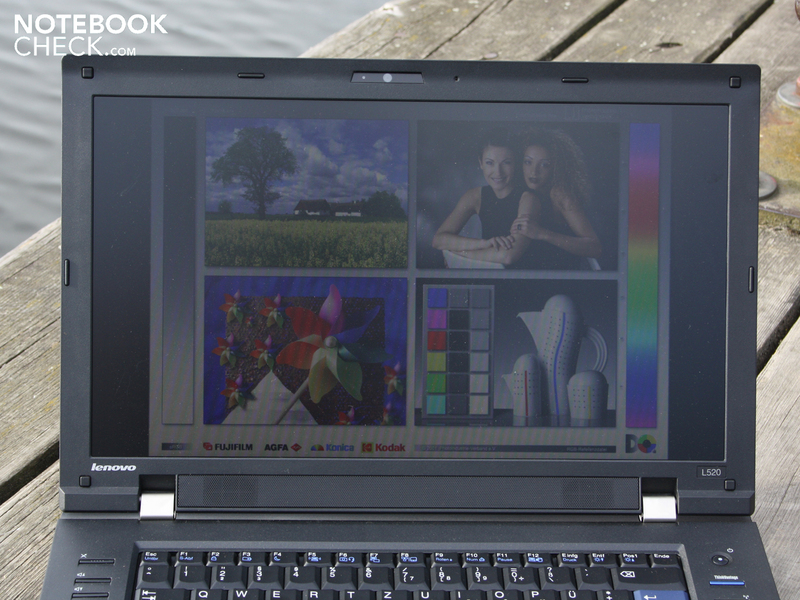 For a little more money there is the HP ProBook 6550b in its 2010 version, with Core i5-450M and WXGA++ (from 730 Euros). The strengths of these two devices lie very closely together, whereby the ProBook has a big advantage with a resolution of 1600 x 900 pixels. The keys can impress with a very clear travel and a good pressure point. The conical shape towards the inside provides for accurate typing. The base plate offers several panels. 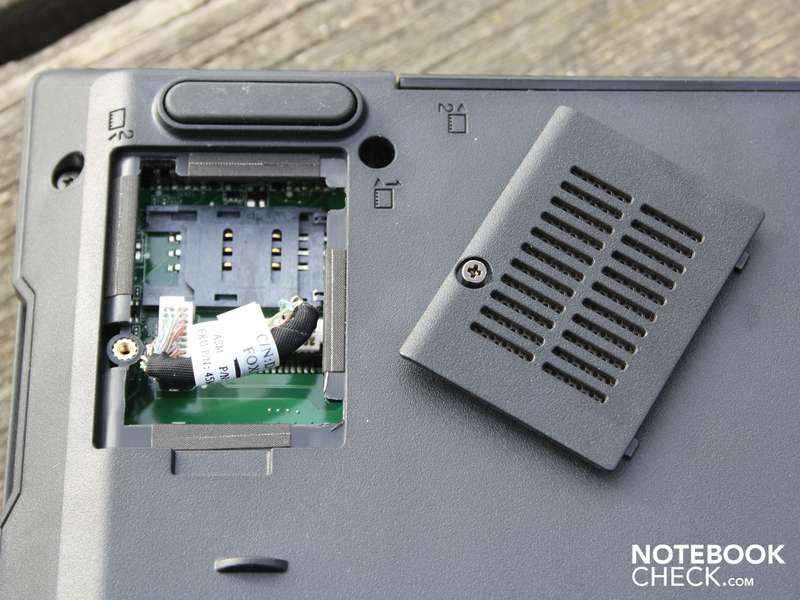 Inside there is room for a full size Mini PCIe 3G/4G card, the integrated antenna is visible. The slot for the SimCard is under a separate panel, not under the battery. The optical drive is not MultiBay (no battery/HDD interchange). in addition to the cooling fan which is impressively quiet. 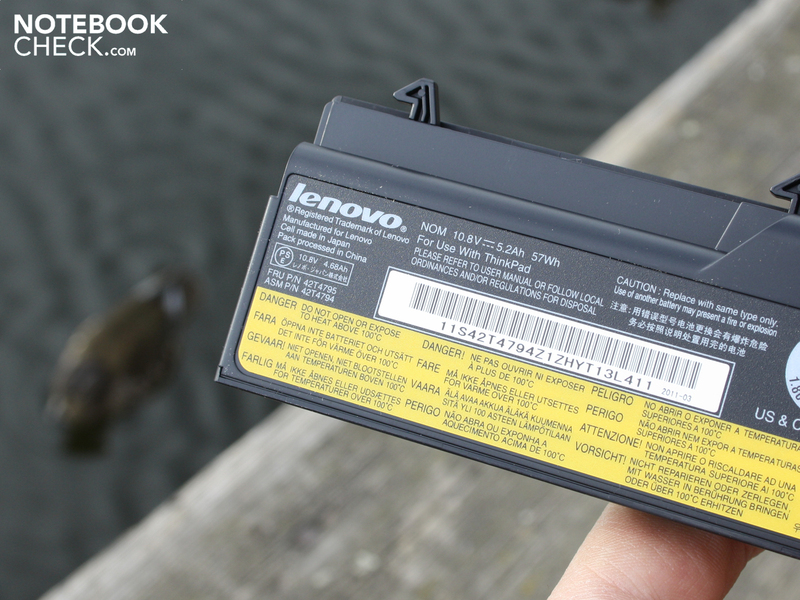 The 57Wh battery (4680mAh) keeps the L520 on its feet for almost 6 hours. 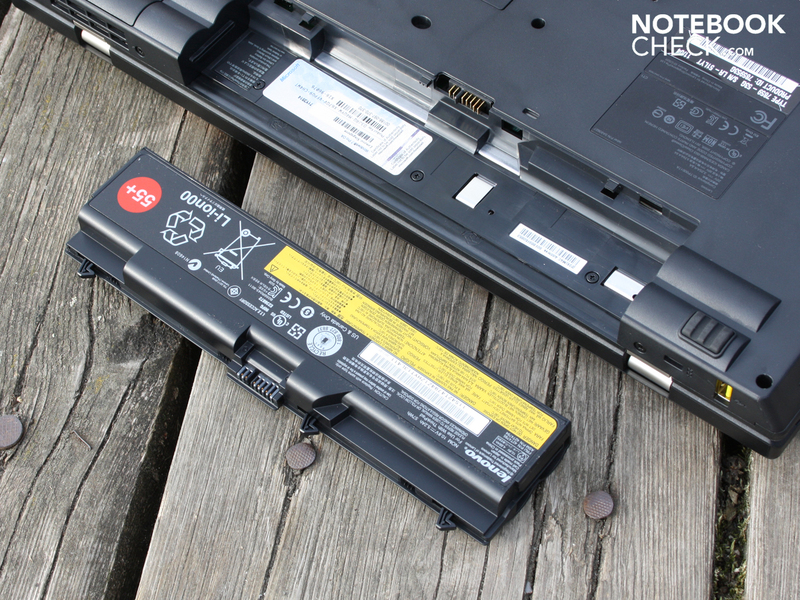 The battery can also be removed for permanent office use. 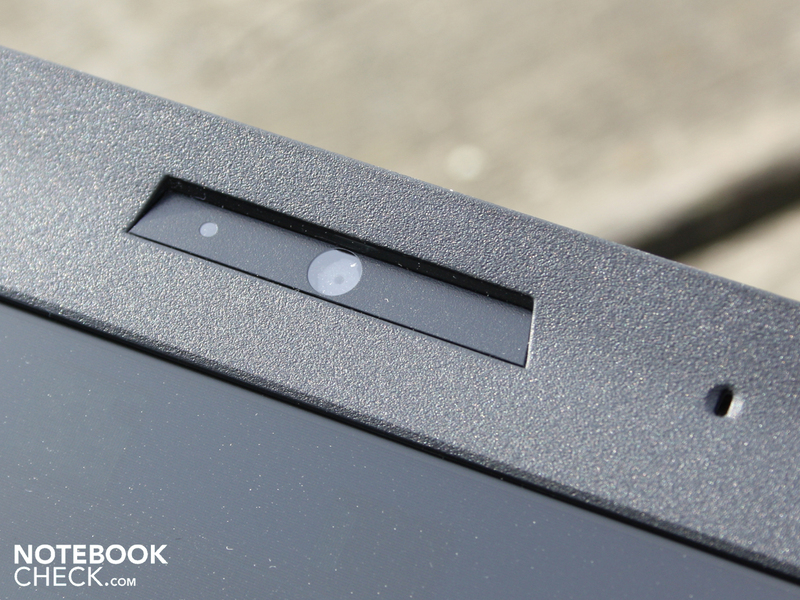 A fingerprint reader is also on board. 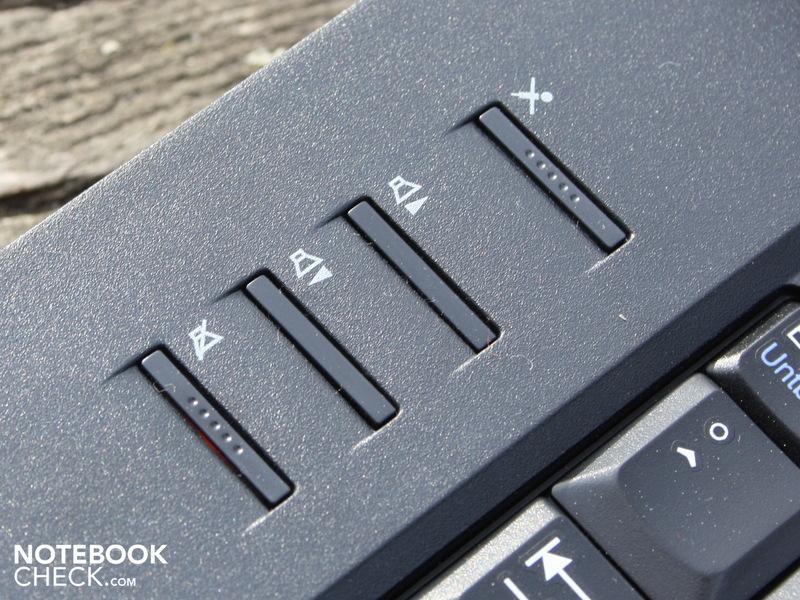 and the volume control buttons. Useful: Microphone mute. the Lenovo L-Series will definitely be interesting. 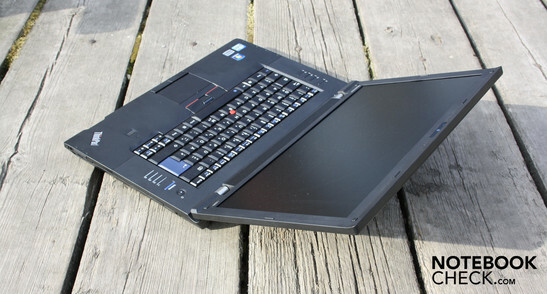 The reviewed ThinkPad L520 NWB53GE is available from a mere 675 Euros. L for low budget? 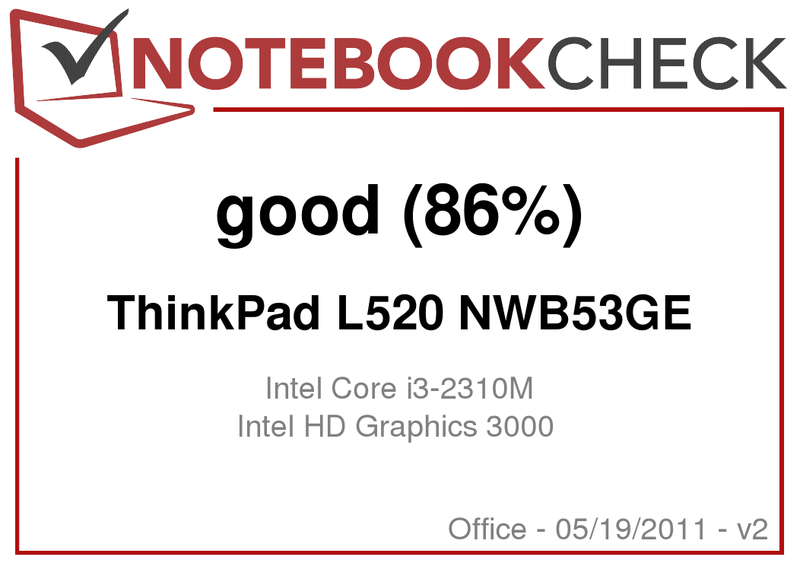 A ThinkPad for try hard professionals? No, since the 15.6 inch L520 gives professional features in the consumer price range. The matte display with WXGA++ (1366x768) makes a start. The Docking Port is rare in this price range, but a very welcome addition. ExpressCard54 provides for numerous expansion possibilities (controller). Below this are eSATA and DisplayPort (no HDMI). especially since this can be added via ExpressCard54 (approx. 20 Euros). The inconspicuous Webcam has a resolution of 1.3MP. The massive steel hinges hold the lid very firmly. 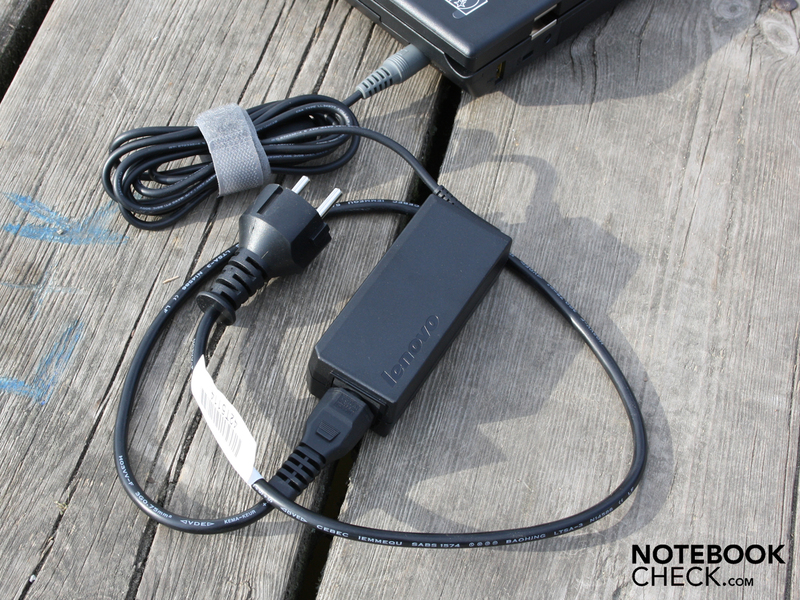 Accessories don't include recovery media for Windows 7 Professional 7 64-bit. As usual, the complete omission of a sensitive glossy finish. A clear key travel on the keyboard, and dual mouse replacement. Stable, although not perfect base unit. A high quality WXGA++ display. The lid could be a bit more rigid. 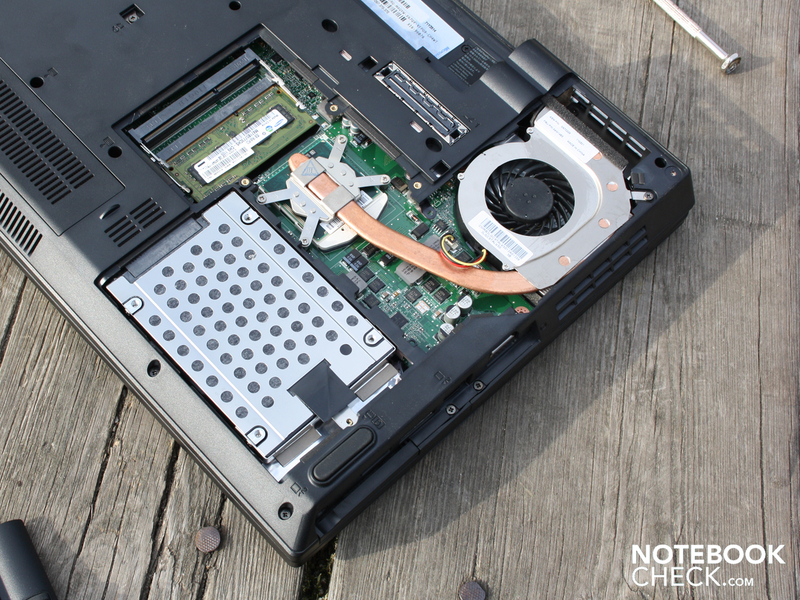 For a Core i3 notebook the performance is surprisingly good. An almost constantly whispering operation, but nevertheless a good application performance.